MF8690 has 290 hp. and is expected to cost less to run than previous Tier III models. Massey Ferguson's new MF8690 290- hp. row-crop tractor is the latest MF product to hit the market with a Tier IV Interim-compliant engine. Company officials say the cleaner engine will over better efficiency and lower operating costs that those delivered by Tier III engines. The 8690 is the fifth in the 8600 Series to be fitted with the new engine, and is the most powerful of the line. The Tier IV Interim engines being used by MF use the e3 Selective Catalytic Reduction system, which allows the engine to be tuned for maximum efficiency and still remain compliant with emission standards. Massey Ferguson's new MF8690 is the latest MF model to come with a Tier IV Interim engine, and boasts 290 horsepower. In addition to the engine technology, the new model boasts one of the largest and quietest cabs in the class, keyboard controls for the 3-point hitch system, depth, cruise speed, hydraulic lock function, as well as engine presets. Also, the Diesel Exhaust Fluid reservoir has been designed to make refills easier -- and less frequent -- than previous models. For more information on the new MF8690, visit www.masseyferguson.com. 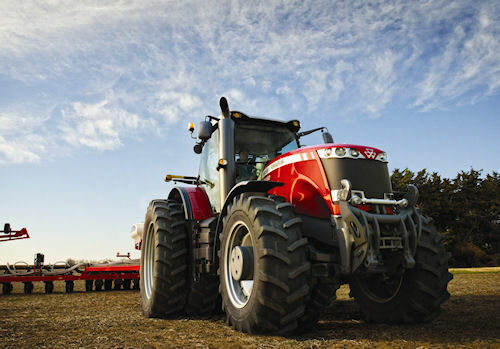 Similar changes have occurred in the Challenger tractor lineup and that information is available at www.challenger-ag.com.